Power Up the Pallet Flow Rack… Spring is Coming! 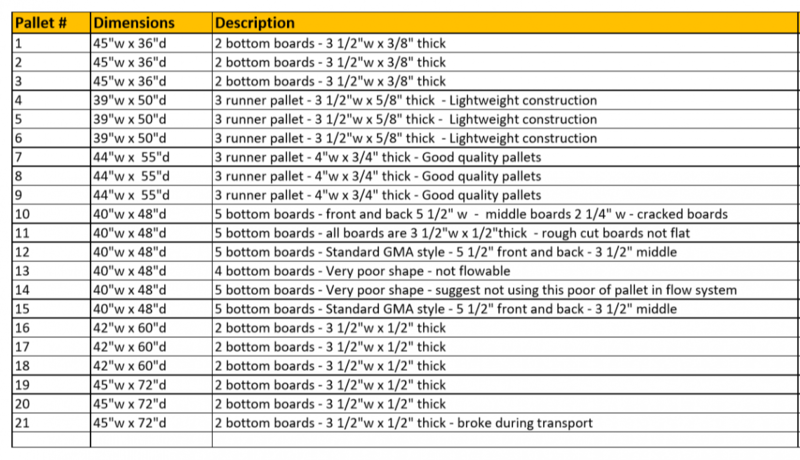 Yeah that’s 21 pallets… six different sizes, thicknesses, weights and conditions. The only thing these pallets had in common was that they were all wood. Undaunted, the Mallard engineers set up the test. Pallet weights from 500 – 1100 lbs. 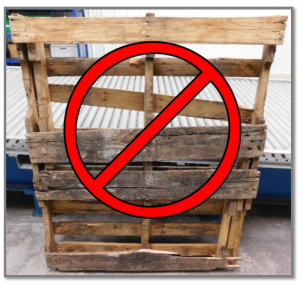 The most important component of any pallet flow system is the pallet, so broken and splintered pallets should be fixed or replaced and never used in the system. Several of the pallets provided to us were set aside because of poor condition, but most were in good condition to use for the test. 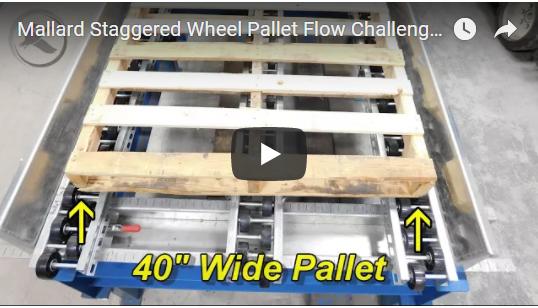 In the video, one of the first things you’ll notice is the rather steep slope of the pallet flow racking. 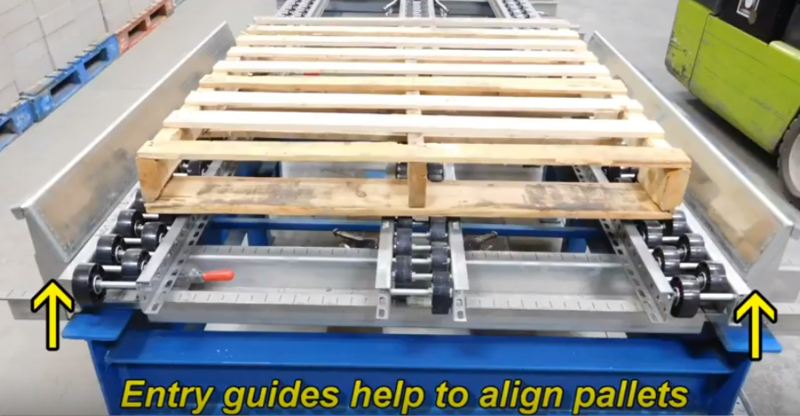 The steeper slope addresses the lighter weights of some of the pallets plus the challenge of consistent flow for pallets with inconsistent bottom boards (runners) design. For example, the pallets with only two bottom boards make little contact with the pallet flow system in general, so the steeper slope helps keep those pallets moving. However, the slope requires the addition of both drop-in speed controllers and bolt-on ramp stops to slow the heavier pallets and to secure all the pallets in the lane until they are extracted by a forklift. The Mallard pallet flow accessory products are what makes this one-size-fits-all approach even possible for such a varied inventory need. Another unique feature of this pallet flow rack system is the width, it is 50” wide. While the average GMA-style pallet is 40” wide, this system will have to accommodate pallets as wide as 45”. The 3-rail design, however, helps keep those wide pallets as well as the smaller, more narrow pallets tracking evenly down lane. The 3 rails provide just the right amount of pallet flow wheel/pallet runner contact but not too much to lead to shifting. Lastly, custom pallet flow entry guides are added to help the forklift driver center the pallet in the lane while loading… which also helps the pallet track properly down the lane. In the end you could say, neither rain, sleet or extreme cold will keep the Mallard engineers from designing a customized pallet flow solution for all kinds of precious cargo… and just in time for Spring? Well, we can hope, can’t we? So, what are your pallet storage or order fulfillment challenges? The gravity flow specialists are ready to talk with you, just give us a call.